Welcome back to another installment of “Let’s Go Camping”, the weekly spring series sharing a new campground in and around Switzerland every Friday through the months of March, April and May. Be that in a tent, caravan or pop top van—campgrounds are holidays your kids will love! If this installment of “Let’s Go Camping" doesn’t get you excited for summer dreams of Italian gelato and pizza, I’m not sure we can help you! 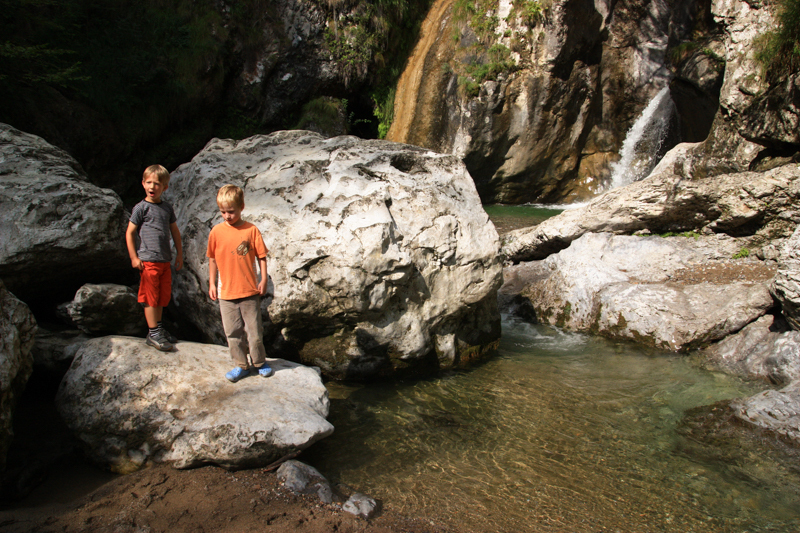 Today we head south through the Gotthard Tunnel and just over the border to Italy and I am excited to hear what Tanya, creator and editor of Moms Tots Zurich, has to say about the campground in Porzlezza. We first noticed this campground on our stay at Parco San Marco and were wondering what it was like. Tanya is originally from California and has been living in Zurich since 2005. She enjoys hiking, skiing and exploring with her hubby and two boys that are now 10 and 13 years old. Like most kids, our kids love sleeping in a tent and don’t care much about where they do it. So we try to do at least one camping trip with friends each summer, like a slumber party outdoors. For several years, we’ve gone to Camping Darna in Porlezza, a tiny village just over the border in Italy, just east of Lugano. Switzerland can sometimes get rainy and cold in the summer, so we like escaping south for the heat and inexpensive pizza and gelato. Most people are in mobile homes and camper vans but we always sleep in tents. But they have plenty of grassy spots for tents, and most are with trees for much needed shade. They also have mobile homes, apartments and permanent tents to rent, all of which have kitchens. They have all the typical facilities of a Euro campsite, with bathrooms, showers, and a little camp shop on site. I don’t remember seeing any communal cooking facilities or fire pits so if you’re not in accommodation where a kitchen is provided, you’ll need to bring your own cook stove. The town has grocery stores and restaurants and is possible to reach by foot. 4. What activities does the campground offer? 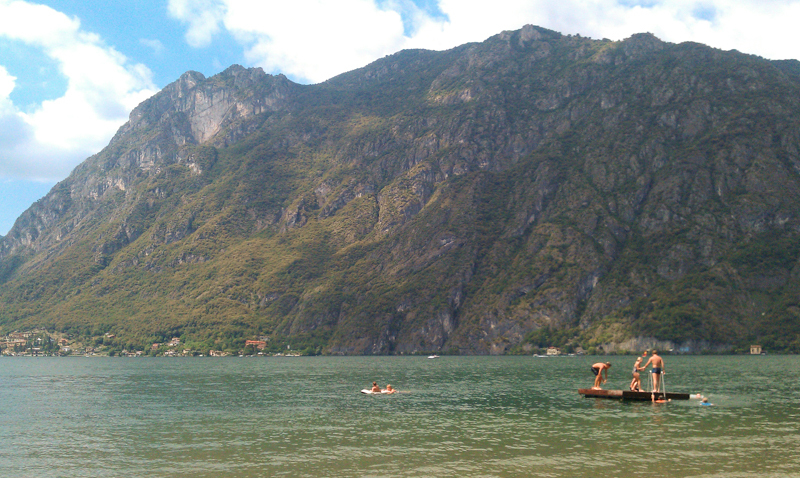 The campsite is on the lake, so there is a little rocky beach for lounging and lots of room to swim. There is a small swimming pool at the campsite and a big swimming complex at the campsite next door, complete with waterslides and splash pools. We typically split our time between the lake and the fancier pool (which is not included in the price of camping). We always ate lunch and dinner at the restaurant attached to the campground, which had yummy and inexpensive pizza and pasta dishes. I loved not having to cook or clean up and could just relax at the end of the day. They also have gelato, which was great. But sometimes we went into town for gelato to try different flavors. There are lots of hiking options in the area but it can be quite hot so we didn’t do as much hiking as we normally do on holiday. One year we hiked to the Begna waterfall, which was really nice. Remember to bring your swimsuit so you can splash in the falls! It’s only a 25 minute drive to Menaggio on Lake Como, where you will find more restaurants, a lovely lake promenade and options for boat trips. It’s about 30 minutes to Lugano, where you can take a cable car to Mount Bre for views and hiking. Definitely bring all your swimming and beach gear, such as sand toys, beach chairs, and beach umbrellas. The first time we went, we bought blow up boats with oars at a shop in town and our kids loved rowing around the lake. If you don’t have beach supplies to bring from home, there are plenty of shops in town with everything you’ll need. 8. Best way to book the holiday? We always go mid-August after the summer rush, so it’s not too crowded. We just call a day ahead to see if they have tent spots. If you are going in July or early August, best to book ahead online or call. Bring cash, they don’t accept credit cards. 10. What sets this camping ground apart from the rest? 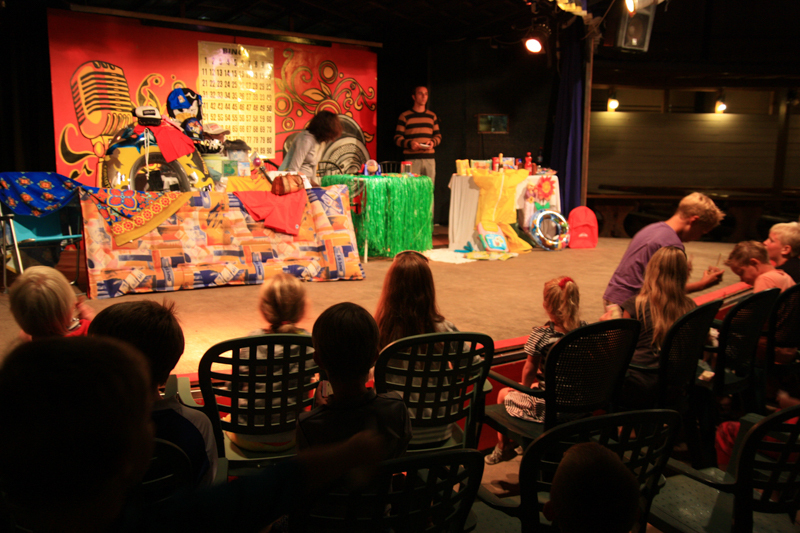 Our kids loved the entertainment program every night during and after dinner. They always did a kids disco, where the camp staff led the kids in a variety of dances. Some camp kids had clearly been staying there for a long time because they knew the dance moves so well! Then, each night had a different program like bingo or some silly play. It wasn’t high quality entertainment, but it was always good for a laugh and our kids loved competing for prizes. They also have organized kids activities and sports during the day. The Catholic holiday of Ferragosto is celebrated on the 15th of August. We just happened to be there on this day and were excited to participate in the local festivities. The town has a big fireworks show in the evening which we enjoyed lakeside while the kids did some night swimming. It was the highlight of the trip. The campground also hosted a spaghetti dinner during the time we were there which included spaghetti and drinks for the whole campground, with extra music and dancing late into the night. 11. What type of campers are you? My husband and I grew up camping with our families in the western United States. We’ve camped all styles from car camping in national parks to wild camping on mountain backpack and river rafting trips. We had to adjust our expectations when we moved to Switzerland since camping is so different here. Instead of an adventure in the wild, I’d characterize camping in Europe as a more affordable family holiday with the social benefits of community living. With kids, this kind of camping can be really fun. A huge thanks to you, Tanya, for sharing Camping Darna in Porlezza with us. You can Follow Tanya on Facebook, Instagram, YouTube and Pinterest for regular tips on weekend outings and family friendly travel in Switzerland. Do you have a favourite campground to recommend to the Simple Family Travel Community? We would love to hear from you! No campground is too small and no campground too luxurious!